St. Lawrence Cruise Lines, which launched its first (and only) ship in 1981 has carved out a river cruising niche that is unmatched by any other cruise line. The company offers two set itineraries: a five-night trip between Ottawa and Kingston and a six-night voyage between Quebec City and Kingston. Though built - and designed from scratch by the company - in 1981, St. Lawrence Cruise Line's 321-ton, 66-passenger Canadian Empress offers a Victorian-era ambiance. The company has maintained its expertise in this region, which straddles Canada (Ontario and Quebec) and New York State. St. Lawrence Cruise Lines is family owned and operated. Canadian Empress is a riverboat that, while built in 1981, attempts to replicate a Victorian era atmosphere. And it works, not just in decor but in onboard ambiance. Generally, St. Lawrence Cruise Lines attracts a more sedentary passenger and activities onboard reflect that. Shuffleboard and trivia games are highlights of onboard enterainment - but the real focus is on the itinerary and on education-based cruising. Folks traveling on this ship want to learn something besides having fun. While by no means offering a luxury environment, the atmosphere onboard Canadian Empress is cheerful, comfortable and pleasant. The fleet consists of the aforementioned one ship - the 66-passenger Canadian Empress. The ship is decorated with the Victorian era in mind. Canadian Empress sails two different itineraries during her season, which extends from May to October. The six-night Quebec City/Kingston itinerary focuses on the St. Lawrence Seaway, which is a prominent engineering marvel; stops include Quebec City, Montreal, Brockville, Ogdensberg, Upper Canada Village and Kingston. 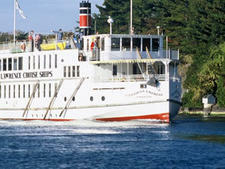 A five-night voyage between Kingston and Ottawa explores the Thousand Islands, Montreal and Ottawa along with Kingston.